Our New tech DOING waste tyre to diesel oil distillation plant is specially made mainly as the auxiliary equipment of our waste tyre/plastic pyrolysis plant. 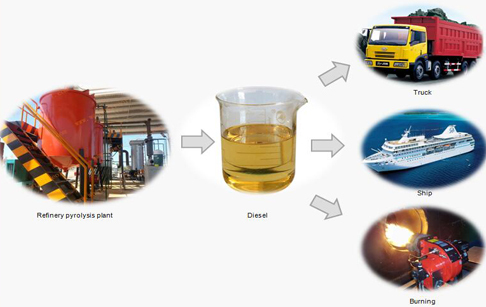 It can refine tyre fuel oil and plastic fuel oil got from the pyrolysis plant into diesel oil. However, Except tyre oil and plastic oil, this oil distillation machine can also refine waste motor/engine oil into diesel. This diesel oil can be used for boilers, trucks, generators, and low speed engine like digging machine/road roller/loading machine and so on. The normal processing capacity for our distillation machine includes 3T/D, 5T/D ,10T/D and 20T/D. 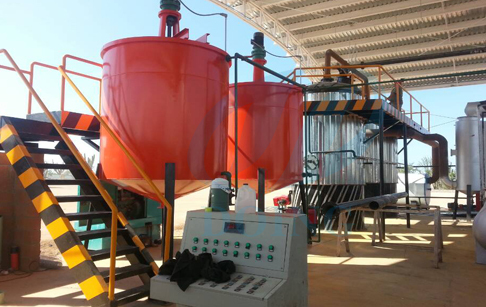 New tech DOING waste tyre to diesel distillation machine is always known for its high working efficiency, high oil output and high oil quality since its first day appearing in the market. Why DOING waste tyre to diesel distillation machine is the new tech? That is because DOING waste tyre to diesel distillation machine has the revolutionary changes on the design of distillation reactor and the heating method. New Tech DOING waste tyre to diesel distillation machine adopts vertical design distillation reactor and indirect heating by heating oil boiler, rather than the traditional horizontal design distillation reactor heated with open fire. The temperature of heating oil can reach 400℃，the distillation process can be finished very fast with the heat from the heating oil, meanwhile indirect heating can greatly prolong the reactor life. The traditional waste tyre to diesel distillation machine heated directly by open fire, and it will take very long time to finish the distillation process and since it uses open fire heating, the reactor body will have short life time, besides, the distillation reactor is horizontal design, it is not easy to do the residue slagging. Anyway , DOING New Tech waste tyre to diesel distillation machine has many obvious advantages over the traditional one. Если вы хотите знать больше деталей о New tech DOING waste tyre to diesel oil distillation plantили о другом устройстве , вы можете отправить по электронной почте market@doinggroup.com. . Если у вас есть какие-либо вопросы, Вы можете обратиться к нашей профессиональной команде продаж и профессиональным инженерам . Вы можете посетить наш завод.